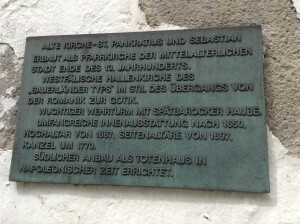 “In the year of Christ 1816, Nov 7th , at 5 p.m., after credible announcement a child was born to Joseph Stahlschmid, citizen and joiner here, by his first spouse Elisabeth Raulf, the third child, a son, the second son, and was baptized on the subsequent third day when he received the names Wilhelm Adam. Hereafter you find pictures of the old church in which Adam is baptized and of the plaque describing the church as well as a translation of the German text. Wilhelm Adam Stahlschmidt emigrates to the United States in 1834 at age 18. He arrives at approximately the same time as his uncle, Anthony and his family. Anthony and Adam file their citizenship papers together, become citizens, receive land grants (land_grant_1 and land_grant_2) , and purchase land in the same area of Cuivre Township in St Charles County, Mo. On February 14, of 1840, Adam marries Agnes Freymuth, a 21 year old woman who also emigrated in 1834 with her family at the same time as Anthony and Adam. 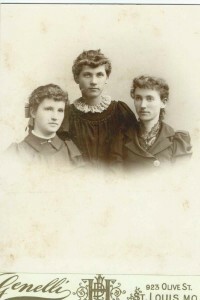 Both families came from the same area in Germany. 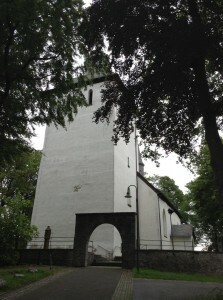 The Stahlschmidts from Warstein and the Freymuths from the neighboring village of Belecke. 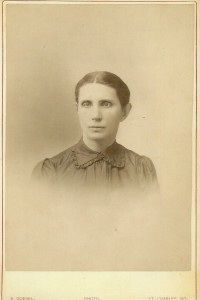 Adam and Agnes have three sons: John Joseph, born in 1840, Wilhelm Augustus, born in 1842, and Clemence Adolph, born in 1844. Adam granted two 40 acre plots of land on April 10, 1843. The family lives together on the farm in Cuivre Township. In 1844, Missouri suffered their worst flood in history. Farms flooded and wells were polluted. The polluted well water caused cholera, which spread following the flood, and thousands died at that time. Unfortunately, Adam was taken ill with cholera and died at age 28 on September 6, 1845. He was buried in the Molitor graveyard , which was the original cemetery used by the German Catholics of that area. After St Paul Church and Cemetery were established, burials were made there. The first and the second of the following pictures is showing Adam’s and Agnes’ second son William August (1842-1878) and his wife Annie Cornelia Emerson (1845-1913) who had five children. On the third photo we can see their daughters Ella, Mary, Celeste (Lessie) - Ella, the oldest was 12, Mary was 4, and Lessie was 1 when their father died in 1878. 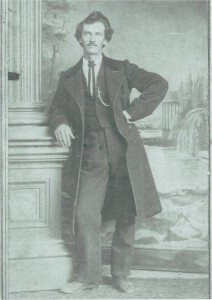 William August’s son William August born on November 11, 1869 had nine children with his wife Mary Elizabeth Dames whose father Nicolas was born in Neuwied-Irlich. The fourth picture represents the family of the before mentioned William August Stahlschmidt junior, one of Adam’s grandsons. 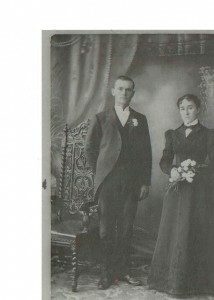 The last one is the wedding photo of Agnes Stahlschmidt’s paternal grandparents, William August Stahlschmidt and Mary Elizabeth Dames. 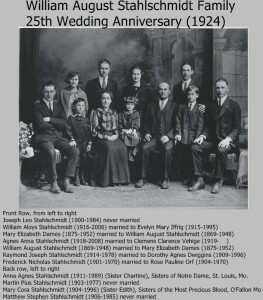 They were married at St Francis of Assisi Catholic Church, Portage des Sioux, Missouri on 12 April 1899. 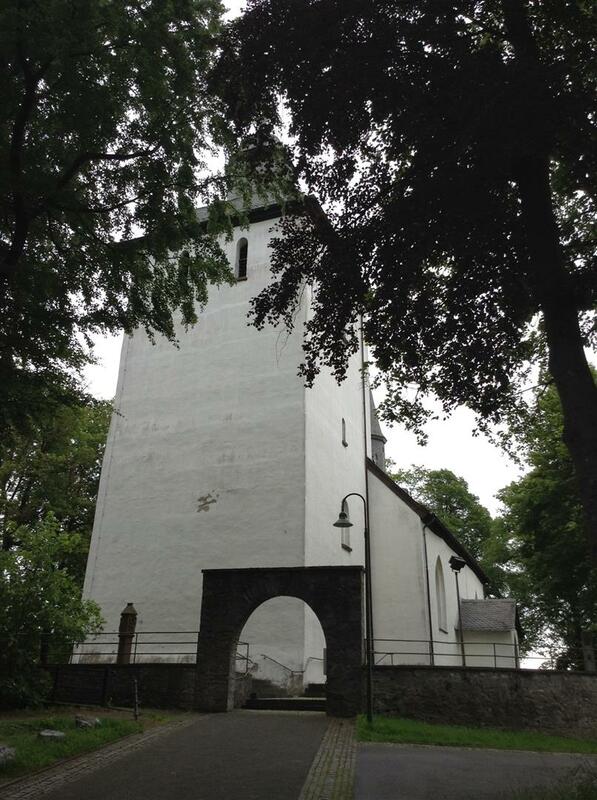 Thanks to Agnes Stahlschmidt for these beautiful pictures.